Most Great Lakes tributaries run high and turbid during and just after peak runoff. To consistently hook steelhead with dead-drifted flies in such flows, you really need to get their attention. Large densely tied, neon-colored flies, like the Scrambled Eggs pattern are just the ticket. John Miller of New York State designed his Scrambled Eggs pattern to catch steelhead in Lake Ontario tributaries when they are high and stain-colored. 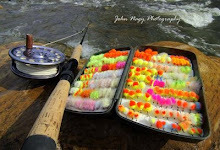 Tied entirely of Glo Bug Yarn, the unique feature of the fly is its “scrambled eggs” texture which steelhead can’t seem to resist. My variation of Miller’s Scrambled Eggs includes a “blood-line” of flame Glo Bug Micro Yarn tied through the length of the fly and a brass, tungsten or glass bead to help sink it quickly in fast flows (and also allow for less split-shot usage). I also tie smaller versions (down to size 16) for lower, clearer runoff flows. The Scrambled Eggs works great dead-drifted alone or rigged in tandem above a small bead-head nymph, wooly bugger or streamer. 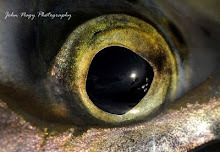 If a steelhead does not take the conspicuous egg pattern, it often takes the more natural-looking nymph, bugger or streamer pattern nearby. Tie the flies no more than 6 inches apart on the tippet so the fish see both flies more easily, especially in off-color flows. The Steelie Rock Worm is a simple caddis larvae pattern that I developed to imitate the green caddis larvae that inhabit the streambeds of many of Lake Erie’s tributary streams. 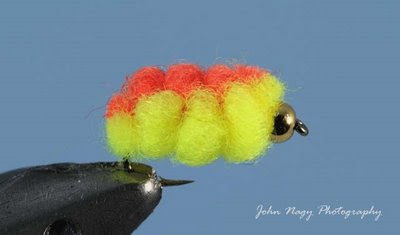 It works great tied in tandem (as bottom fly) with an egg pattern like the Scrambled Eggs. Body: For a size #10 hook, secure a piece of chartreause Glo Bug Yarn and one piece of flame Glo Bug Micro Yarn together just behind the hook eye. The exact thickness of the chartreuse Glo Bug Yarn piece used will vary according to the hook size (less for a smaller fly, more for a larger fly). Each piece is about 3 inches long, with the flame piece positioned on the top of the chartreuse. Working backward, starting just behind the hook eye, make three segments out of the yarn with the thread finishing at the bend. Next, take the thread and work forward, wrapping diagonally over each segment once (creating the "scrambled eggs" effect), and whip finishing at the eye. Cut surplus yarn at the hook eye and bend to form "head" and "tail". The addition of the flame Glo Bug Micro Yarn creates an appealing blood-line effect. Steelhead orange, baby pink, oregon cheese, egg and peachy king Glo Bug Yarn can be substituted for the chartreuse. Body: Fluorescent chartreuse antron yarn (spooled), ribbed with round gold tinsel (small or medium) and sealed with Loon Outdoors Hard Head clear finish. Head: Single strand of black angora yarn, wrapped to form head behind 3/32 inch or 1/8 inch gold bead. 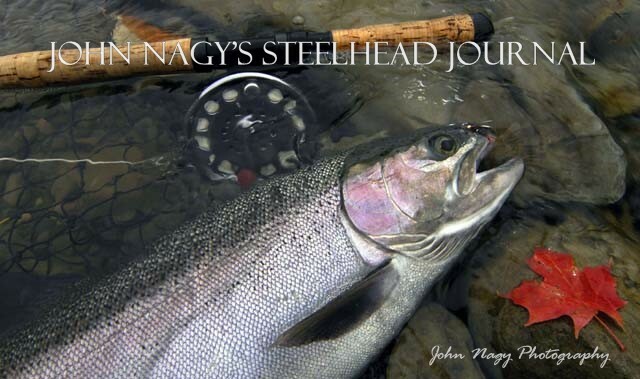 For more Great Lakes steelhead fly patterns refer to John Nagy’s book “Steelhead Guide, Fly Fishing Techniques and Strategies for Lake Erie Steelhead”.